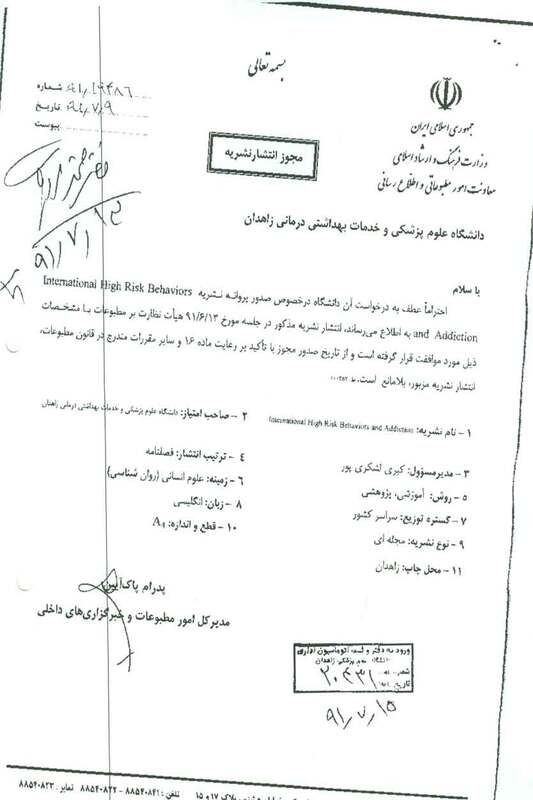 Publishing Approval Minister's deputy office in press and publicity affairs of ministry of culture and Islamic guidance according to certificate number 91/1948 on 30th September 2012 as an International Quarterly Medical Journal. 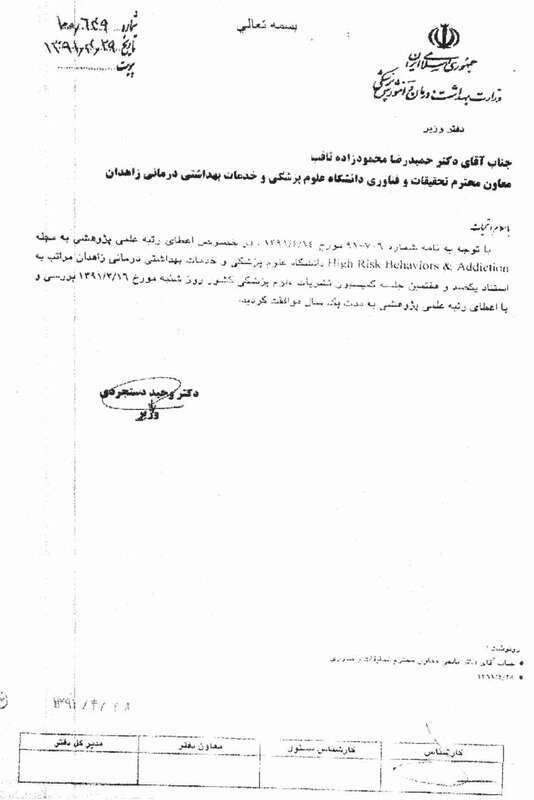 Scientific Research Approval The Iranian committee of medical science journals of the ministry of health and medical education according to certificate number 100-649 on 19th of July 2012 as Scientific Research Medical Journal. Aim & Scope International Journal of High Risk Behaviors and Addiction is a clinical journal which is informative to all fields related to the high risk behaviors, addiction, including smoking, alcohol consumption and substance abuse, unsafe sexual behavior, obesity and unhealthy eating habits, physical inactivity, and violence, suicidal behavior, and self-injurious behaviors. This authoritative clinical journal was founded by Zahedan Medical University in 2011.
International Journal of High Risk Behaviors and Addiction is an authentic clinical journal which its content is devoted to the particular compilation of the latest worldwide and interdisciplinary approach and findings including original manuscripts, meta-analyses and reviews, health economic papers, debates, and consensus statements of the clinical relevance of Risky behaviors and addiction. In addition, consensus evidential reports not only highlight the new observations, original research and results accompanied by innovative treatments and all the other relevant topics but also include highlighting disease mechanisms or important clinical observations and letters on articles published in this journal. Article Submission Charge There is no article submission charge in this journal. Digital Archiving Policy This journal deposits its articles in PMC (till 2016) and Portico to guarantee long-term digital preservation.